We didn't travel anywhere for the holidays this year, and so far it has been really relaxing. I was wondering why people make the holidays into such a crazy thing, but then I thought of my favorite holiday things in the past. 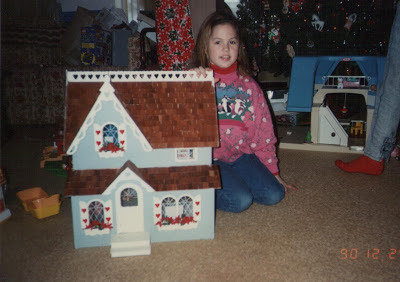 In 1990, my grandmother gave me a dollhouse she had made that had real electricity, actual newspapers and magazines, bacon and eggs cooking on the stove and a whole family complete with a dog and a pet turtle. We sometimes like to go to the Troy farmer's market without a preconceived notion of what we'd like to prepare for dinner, because sometimes the available ingredients will suggest a meal themselves. A couple weeks ago, we got some lemon pepper fettuccine from Flour City Pasta, thinking it would come in handy later that week. But when we sampled and were then compelled to purchase some remarkably good feta from Danascara Cheese, a meal immediately suggested itself: a Mediterranean pasta dish. I've been making variations of this since learning a basic recipe from my mother. I love your baguette (pictured above) - so crispy and flaky on the outside and yet chewy and moist on the inside. It is a marvel of baking perfection that I can't accomplish since I spend my days running around a museum, but payng you $4 is well worth the price. I love croissants too (I haven't tried them, but Daniel has). I love the look of all of your pastries, and simply just being in your store. I love that stopping for anything, not only gives me something that tastes great and vastly improves the sophistication level of whatever I am having for dinner, but makes me feel vaguely glamorous - like I should be carrying a hat box and going to pick up my poodles from the groomer (yes, I will take a pistachio macaron, thank you!). I love you like I love a sparking rosé wine on a hot and humid day. I love you like I love Valentine's Day. Holidays can be stressful, but I am determined not to feel that way this year. Instead of traveling, going broke, and feeling overwhelmed, how about we remake the holiday season into being all about cookies, television, and pajamas? There is no reason to get worked up about the commercials with the big bow on the Lexus in the driveway. What I like best about the holidays is someone walking up to me and handing me a jar of homemade granola - simple, thoughtful, not expensive. 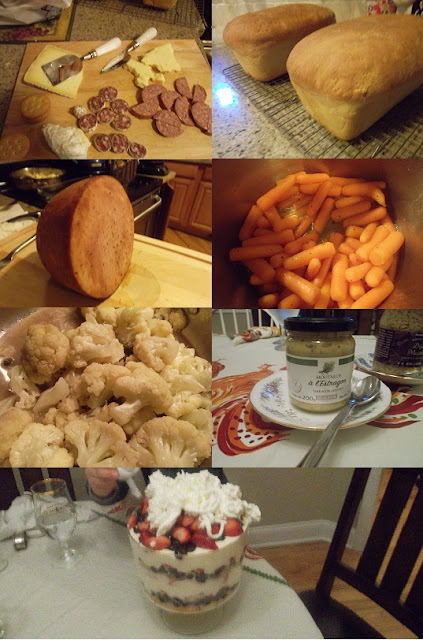 Check out my post about homemade Christmas gifts last year. I also like cookies - lots of cookies. Check out my Edward Hopper cookies I made last year (am I the only person who Googles "art history inspired holiday cookies"? the search results are not impressive). Also, check out my post about the cookie exchange I organized last year at my former workplace. But - enough about last year! My friend Sandy is a total cake-making genius. What I mean by this is that she does awesome things like putting a drop of cheesecake oil in her frosting and creating cupcakes that are unbelievably light and fluffy. I've gone to parties where I end up taking 4 cupcakes home, and they don't make it through the night. She has recently branched out on her own and created "Chaos and Buttercream", and she has a website! Check out her amazing and beautiful cakes here! Check out I'm featured in the From Scratch Club podcast this week. Also, I wrote a post about chocolate covered espresso beans. This morning I was successful in getting off the couch from my watching Alias on Netflix, and we made our way to the Troy Farmer's Market. 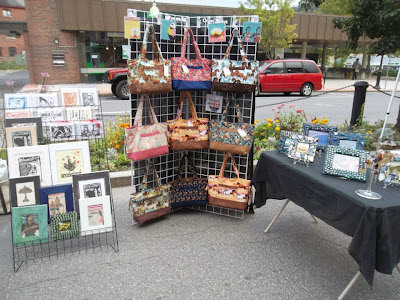 We got some great items, and saw a lot of cool people. I'm a huge s'more fan, and when I saw these at the DreamPuff Marshmallows booth I could not resist. I took it home and put in a 350 degrees oven for about 5 minutes. This is a ridiculously delicious item! We had my husband's friend from grad school in from Ohio for Thanksgiving last week, and we really showed him a tour of the area. We took him to Bennington, Cooperstown, and down to the Poughkeepsie train station - all in a three day period. On our way down the the train station, we passed the Harvest Spirits Farm Distillery, and I was so excited to see where that was I actually did a U turn. A couple years ago Revolution Hall stopped being a venue for concerts and became a private events space. Now you can have your wedding there! We went to a wedding reception there last night. There was a totally awesome photo booth the groom and his friend built. Here was the result. I have been a huge fan of Saratoga Spice and Salsa Company for years (or as we call it, the hot sauce store in Saratoga). Recently I mentioned it to Deanna of Silly Goose Farm, and it was a shame that she didn't know what I was talking about. It is an awesome little store in the middle of town with more kinds of hot sauce than you might even know existed. They have a tasting booth set up, and in the past when we weren't able to decide which one to get, we were able to try all of the hot sauces and get a sense of it before making a commitment (as a sly marketing move they also sell bottles of water now). I've long wanted to have a fancy brunch party. We've got a lot of cookbooks, and I read about things that sounds fabulous and laborious like stratas, frittatas, and quiches. Are you really going to wake up on the weekend and start rolling out a pie crust? No, no you are not. I have made in the past mushroom ricotta crepes, cinnamon buns with buttermilk icing, and the first thing I ever cooked on my own from scratch was a goat cheese and leek quiche. Well, we all know the best thing to motivate you to cook fancy things is to invite other people over, and what is more fun than a fancy brunch? Here's someone who likes the idea as much as I do. Martha Stewart also has some ideas, and I love them all. I'm here to say that real life is not as beautiful as Tastespotting. How does that make us all feel? Inferior? Pathetic? Like we don't plan out our meals well enough or make them look beautiful enough? I didn't really want to write a "How Emily Really Eats" post for the From Scratch Club series. Why not, you ask? Because it might be like "I had a hard boiled egg, a Special K Protein shake, and then my husband prepared a beautiful roast chicken dinner, and we had a fabulous Pinot Gris from the Finger Lakes". There are things to be embarrassed about, like eating lunch at your desk. There is even a chick lit novel called "Sad Desk Salad". This is why I love so much the tumblr Sad Desk Lunch. The reason it is so much fun is because it is honest. I love it. It makes me feel great in a way that Pinterest can make me feel bad (if you haven't read it, check out this great New York Times article on the topic). Check out my post on From Scratch Club! The week before last week, we went to the Magnetic Fields show at Club Helsinki in Hudson. I hadn't really been to Hudson before outside of an Amtrak car, and I'd always heard great things about it. You can just get tickets to see the music, but it is way classier to get a table and eat dinner while you watch the show. Also, the menu is great. It is Southern inspired and makes use of local, seasonal ingredients. I got their first and ordered a glass of Pinor Noir which was very tasty, and some of the fried okra with a Cajun remoulade to start. I happen to love okra done right, and this dish had a nice corn meal crust which wasn't greasy at all. I took in the surroundings, like what I imagine the Copacabana to have been like in some far off past decade. Cause God knows it's been done to you / And somehow you got through it"
This all makes me reflect on the town I've spent the past three years working in. I always thought Mcgriddles at McDonald's sounded totally disgusting - sort of like Paula Deen's Krispy Kreme sandwiches. But today we stopped in at McDonald's for breakfast, and Scott got one. I was very skeptical at first, and I found the first bite interesting. I took another bite, and then I realized something - it isn't supposed to be like a weird mix of sweet and savory, it is supposed to be like a portable version of pancakes that is not as messy and does not take as much time to eat. Actually it wasn't half bad - certainly not the most disgusting thing in the world. Who knew? This weekend we headed down to NYC for a quick trip. Our friend Jacqui, co-owner of a wine bar we loved when we lived there Rest-au-Rant, is moving back to Berlin forever, and there was a farewell party for her. We felt that Jacqui herself and that particular establishment at a certain point in time was really important in our lives, so it seemed right to say good-bye. We had the Spanish sausage for an appetizer that was oven-roasted in red wine sauce and spices. It was fabulous. See full menu here. We had a couple paninis for old time sake too, because we always used to get them years ago. As part of my Treat Yo'Self this afternoon I checked out Yeh! Yogurt in Crossgates Mall. This may be the first time in the history of this blog that I have genuinely disliked something. Ugh! It was like ice milk - grainy with a viscous texture and cloying flavors. I tried the cheesecake and vanilla flavored yogurt. Toppings were alright, but there is no getting around the yogurt tastes bad. I don't say Yeh! I say Nay! Yogurt. Check out Kristi ranks the area's frozen yogurt shops! About Yeh! Yogurt Kristi says: "It tastes similar to ice milk with little flavor and even less creaminess." Much better I think is the Yo D. Sert near the movie theatre. I am pretty sure that one seemed way more reasonably priced, but you'd have to compare directly to know for sure. Tour de Crossgates Yogurt - Daniel! You know I love the Whistling Kettle. I once wrote about the tea and another time about the whole experience. Well, I checked it out again today, and it was a lovely lovely lunch. It was quite possibly a little celebratory lunch, so I decided to treat my self. You know how I love the Berkshires, but if all goes well there could be a lot more buckets of fried chicken in my future. 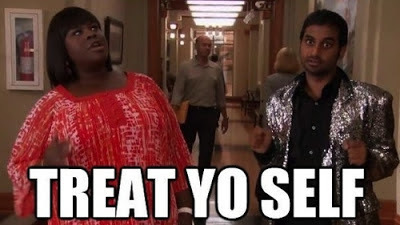 So I say, treat yo self! I got a pot of the lavender Earl Grey because I absolutely love it. This tea is just so elegant. The subtlety of the lavender and the Bergamot oil mix so beautifully with the high quality tea. It is the kind of delicious food item that makes you stop and think. It slows you down, and forces you to just live in the moment. I ordered a curry chicken salad sandwich with pecans and a side salad. Check out my post on From Scratch Club about Finger Lakes Distilling. As an update, I saw yesterday at Exit 9 in Halfmoon that they sell a whole range of their liqueurs including the Maplejack one I described. My in-laws came to visit, and we checked out Yono's. I thought the food was fabulous, and liked that it felt light in my stomach even though clearly a lot of thought and skill had gone into the preparation. We had a great time at the Fresh Grass bluegrass festival at MassMoca where we also really enjoyed the "Oh, Canada" exhibit. We checked out Mezze in Williamstown too, which everyone loved. I've made use of my bear cake pan I bought at the Confectionery House with my friend Sandy. I made this one for my friend Elizabeth. I went to my cousin's wedding in Michigan, where my sister put the bridesmaid dress she wore for my wedding on me. I've wanted to make Thomas Keller's oreo recipe for a long while now, ever since I read the recipe back in 2010 on Tracey's Culinary Adventures blog. Yesterday my friend Jessica and I were at J & A's Prep Kitchen talking about what to make for the From Scratch Club food swap (derryX went there last year). I was like "Bagels? Pasta? Hmmm..." We talked about low fat foods while eating fattening appetizers, and I said I thought about making oreos one day. Her reaction was like "Ohhhh.." and that made me think it was a good idea to just go ahead and make them. High brow/low brow, fancy from scratch junk food - best of all worlds. First, I chopped up the butter. I got this awesome knife when my coworker went to Alaska as thanks for dogsitting. It is an ulu knife. People in the arctic in the past used it for everything including cutting hair. It is a really nice knife and perfect for cubing up butter.